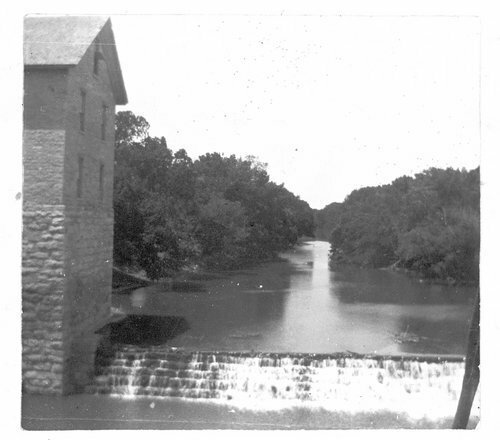 This black and white photographs shows a view of the Cottonwood River and the Cedar Point Mill and Dam in Cedar Point, Kansas. The three and a half story native limestone structure was built in 1875 by abolitionist Orlo H. Drinkwater and his partner Peter Paul Schriver along the Cottonwood River. For a number of years flour was milled from the facility until operations came to a close in the early 1940s. In 2006, the site was nominated to the National Register of Historic Places.